197: 100 top designer #95..
Hey I am part of another blog tour, and I wish I could be more “with it” right now as I write, but I have been working extreme retail hours in Christmas prep work on top of my everyday work. 77 hours last week, so please bear with me as I try to share the fun news…. 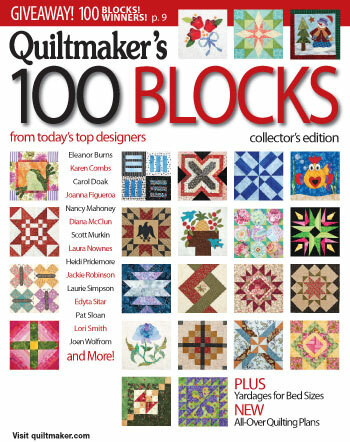 Last spring I was invited to participate in a special publication of Quiltmaker’s 100 Blocks from Today’s Top Designers….so I said “sure!” and sent in two blocks for them to choose from. Well I made it in…just barely at #95, but I am in! So fun saying that I am in the 100 “Top” designer’s club…..but I know there are alot of other big names that didn’t have blocks in there, but it is fun to say that I am in there anyway! I didn’t name the block, but I do rather like it. It was fun to be featured in this issue with 99 other great designers. I really like how the robin’s egg blue and cheery cherry red play together in this block. The fabric is from Lecien, a company which seems to be growing quite a bit in the marketplace and I am glad because they have some very wonderful fabrics. Check them out! Another cool thing that Quiltmaker is doing with this issue and the blog tour is a big giveaway! I was asked to send something to them to help with their prize pack, and I sent in this sample pack of Moda 10″ squares that I had extra of…all in nice fall/winter colors…..
Well, I really would like to share more folks, but I am exhausted from work, and I still have more to do at Workville, so I need to leave Blogville once again. But breifly before I leave here are some pictures of a nice little autumn tableau we have going on here at Shiloah Cottage–cause I know you peeps like the pictures! My mother in law made and painted these houses over 20 years ago….aren’t they incredible?? and they open up and have details inside too!! They are definitely a treasure! Love your block, and the secondary patterns that emerge in the mock-up. It’s Indian Summer here in KY so I’ve been doing yard work and enjoying the weather before it turns cold. Also making fall table runners and (just for fun) baby quilts. My holiday preparations are behind — this will be one of those “last minute” years! Congratulations Scott! I love the block you did. I’m working on a nautical flag quilt for my son but I still have to finish the square in square that I made for dear young hubby. love the pictures and the houses.congratulations for being chosen a top designer.Im busy baking many fruit cakes for family and friends. Great block..Thanks for the pics of your table display. The little houses and decorations are wonderful. Love the quilt block you made, Scott! And isn’t it nice to say you’re in the Top 100? Those tiny houses are pretty amazing, too. Talented family! Love that your block makes a secondary pattern. Thank you for presenting it that way. I love the little building fronts that your MIL made. What a treasure! I love the tableau, Scott! Pastel houses and all:) The turkey makes me smile. Congrats on being one of the designers picked. I hope you recover from the pre-holidays busyness and get to enjoy some festivities too. I’m not making all my Christmas gifts this year. Instead I’m trying to finish some UFOs so I can start fresh next year. But I have been playing with new designs and making small gifts too – just no pressure gifts this year! This magazine will make a great gift – to give or to keep! congrats on being a top 100 designer. You have a lovely blog too! Congratulations on your magazine entry… I have some flower sugar just waiting for a project, Hmm??? I love all of your holiday decorations! I’m still not convinced that it’s actually November. What happened to October? How many days until Christmas??? Yikes! Oh my goodness congrats on the block in the 100 blocks I like the red, blue and dots all together! That fall village is just fantastic, what a memory I think I will have to go unbox my holiday village and put it out this week because I love looking at all the details. count me in for the giveaways. I’ve had good luck here! Thanks so much for the chance to win a copy of the magazine! Try no to have too much at Workville. Love the houses! I’ve finally got a few tops done for Christmas (I was aiming for 10 total for my sister’s children but only have 7 done). I picked up flannel for the backs & will be quilting them on my stepmother’s longarm starting this weekend. And, then the binding (I “cheat” and sew them on though). If that all works out, I’ll be on time with my Christmas presents for the first time. Thanks for sharing your design & your blog. Love your houses, and your block! LOL! Good luck in getting everything you need to accomplish. I’m about to finish a quilted throw, for me, and am about to start a quilt for my sister… Thanks for the giveaway! That quilt block is soooooo pretty! I love the colors! Right now I’m preparing for the holidays by trying to finish up all my home projects. Painting a couple pieces of furniture and sewing curtains and pillows so I can get started on my Christmas decorating! It’s been fun to visit new sites like yours during this blog hop of blocks. I like your block – I’m anxious to see the magazine to be able to create some new looks. Your MIL’s houses are amazing! She must love what she does – such detail!! Thanks for a chance to win! I’ve subscribed to your blog so I can follow along. I love blocks like that and I have seen the Lecien fabrics, they really have some wonderful designs. That little set up, is such a fun idea to use for holiday decorating. Congratulations, Scott – that block is stunning!! Count me in on your grand give-a-way! I am getting ready for the holidays by making gifts. i am finishing up UFO’s to give as gifts. This is a very tight holiday season for us. Congrats on making it into the magazine. I love your block. I LOVE the colors of your block, something about that blue with red is high on my favorites list right now! This blog tour is so fun! so many creative people I am feeling quite inspired….then again I have to clean the house to haul all my stuff out, and inspiration just flew right out the window. Guess I better hop around some more. I love your decorations too, and I hear you about retail hours. Sure I just work in coffee, and we don’t change much, but business is picking up so we have to do more in the same amount of time! I really like that you chose a star and that it is so prominent in the finished block. Congratulations for being one of the 100 chosen! Very pretty block. Thanks for the sample layout. Really like the autumn decorations. The houses are great. Lucky you, what a talented mother-in-law. Thanks for the prize! Hope I am lucky enough to win. Working hard at a couple of wallhanging and Christmas stockings for my Christmas gifts. I have been making some table runners in Christmas fabrics for presents, and some chicken pincushions. I am binding a quilt in Christmas fabrics for my sister.s pressie, and have just started another one using Moda’s faded Memories range, which is also Christmassy. Oh, and I have bought a tin of chocolate biscuits! Your block was one of my absolute faves in the magazine. Mine is Old Glory and my day on the tour is tomorrow. Congrats on your block and its inclusion. It’s a great design and fabulous colors! yes … i DID read all the way through! cool houses and i really like the star block, too! Congrats on getting in! Better to be 95 than 101, though I doubt they numbered them in some judgemental way. Your block is great, I love stars. I can’t believe I’m the first post! Your block is wonderful. As to preparing for the holidays, I’m trying to finish my Christmas shopping first and foremost. I buy throughout the year so I’m close to being done but still a few more things. I hope to finish on Saturday. Those little houses are great! You have a very talented mother-in-law! and you are well ahead of many in your holiday decorations. Thanksgiving decorating here will be summed up in baking six or so pies – and then it will be time for Christmas! Congratulations on the publication of a beautiful block. What charming houses! I love little tableaus like that. Right now I am in the process of finding yummy recipes to fill family and friend’s goody bags for the holiday (oh….and making an incredibly extensive wish list of fabrics to fill my stocking!) Sign me up for the giveaway! Congrats on being featured in Quiltmaker’s 100 Blocks. Love your block! Cute display. This is the first time that I have seen your blog. Nice page. Enter me in the drawing and I will be back. I love your block. Your fall decorations are really great. Love you block. I’m not ready at all for Christmas………..grin. I’ve never ready. I’m hoping I’m the lucky one and score a copy of the magazine. I love the little houses! I’ve always wanted to create a miniature house and decorate it. I love your block and fabric choices too! Great block! Congratulations on being included. Look forward to studying all the blocks in the magazine. I really like the colors you used in your block – really bright and cheery. I’m getting anxious to see this great book of 100 blocks! Hello! I love the color combinations in your block!! Please enter me into the 100 Block giveaway…. thank you for sharing those pictures, I those houses are GREAT! Well Scott (my husband and son’s name as well) I love your blog and you obviously are working very, very hard!! Hope you’re awake for Christmas after all this! I think it was an honor they picked your block, and you have to love anything done in aqua/blue. The fave colors of the year along with blue/brown I think. Mine anyway. Those houses are so cool, and a great heirloom for the family. Miniature vignettes are really neat to set up. The best thing about this Hop is getting to meet all these designers and artists in blogland that I might never have. It’s been so fun, thanks!! I love your block! I love it in the Lecien fabrics..and it would be wonderful in any style! Someone had such a terrific idea to have a book with 100 blocks from all different and talented designers! Robin’s egg blue (or aqua) and red are a great combo. I love the way work together in your layout. Congratulations on being one of the best! Since you asked about holiday plans, I’m trying to come up with a Christmas table runner for my sister-in-law. She has given us several of her painted ceramic Santas over the years and I really owe her a handmade “something”. I loved the houses in your fall display! Your creativity inspires me when I am very tired from my day job. Thank you so much for sharing with us! Your block is beautiful. It’s red, white and blue, fantastic! I love the village houses your mother-in-law made (she made them?!) and painted, they’re delightful! Just getting ready to start making Christmas stockings, an annual tradition! Cool block, I see lots of ideas in it. I love that you guys have paused on thanksgiving/fall decorations, we always rush so headlong into Christmas. Currently I am working on a quilt top based on your owl quilt using my version of your pattern, lots of blues, oranges and browns. I will send you a picture. Get some rest! Love your block–the picture really shows how wonderful it will look as a quilt! My husband stopped and admired it too! Congratulations on being in this special publication…for the holidays, I am making a special quilt for my brother-in-law and so very excited to be able to surprise him with it! Love your block and the colors – so kudos for being in the Top 100! Don’t work too much! I took a time-out myself and admired your display house pictures. Wow, I can only imagine how much imagination and work did go into these. Let’s hope they will make it another 20 years ( at least!). Thinking up names would be hard for me too – but looks like they choose a great one for your block 😉 Thanks for the giveaway – you asked what I’m up to .. I just finished the Christmas Lights Mystery pattern that was published in Quiltmaker recently and love how it turned out -you can see pics of it on my blog. I love your mock up of a quilt…very cute pattern translated into a quilt. I love the colors and everything. Well, I am trying to sew some presents. A wallhanging, pillowcases, table runner, etc. BUSY! Love the secondary designs in your block! Holiday preparations: quilting on customer quilts like crazy so I will have time to quilt a gift quilt before Christmas. I’ll start my shopping this week with a trip to the “big city”. Congrats on your being published in the magazine! I love the colors of your block. Please enter me into your give-a-way! I love your block! And you are right the blue and red works so well together. Can’t wait to see the magazine. congratulations…lovely block…. with a schedule as hectic as you have I am amazed you managed to post anything. Congratulations on making it to the top 100! Like you say, you’re in and that’s all that matters. Those red, blue and whites look lovely together. I love all your fall decorations too. Great block and blog and, yes, I too read all the way through. Didn’t want to miss anything and certainly wasn’t disappointed. Thanks so much for sharing your time and talent with us. Your block design is just stunning. Congratulations on being asked to participate. It was a well-deserved honor. I love houses of all sizes and shapes. What a wonderful talent your mother-in-law has. Luv the block, get some rest so you don’t take ill! Congrats on being 1 of 100! Your block is just lovely and I love your choice of fabric. I also think you are very lucky to have such a talented Mother in Law the houses are so cute and I love the way you have used them. Thanks for the giveaway! I love your block. I’m busy making a list of Christmas gifts to make. Starting to get overwhelming! What a great block! I’m glad you made the group – you are a very talented designer, Scott. I love Lecien and your combination of fabrics is great, as always ~ Add me to the giveaway list, I’d enjoy seeing the magazine with the other 99 blocks especially! Love your block and your color and fabric choices! Congrats on your submission to this magazine. Congrats on making it in the magazine! I love that block. Hmm. Wonder if I can find a copy of the magazine at my local….BARTELLS? 😉 Miss seeing you over there. Hope they still keep stocking all the quilt magazines! I love the block and the quilt.